Our sails seemed to still be in great shape, and we had used the main at most of the district or national events over the past few years. The jib had a 2014 royalty tag on it, and the spinnaker a 2013 royalty tag. So even though they weren’t brand new, but we felt the sails all had great shape and our game was needing improvement in other areas. We dug through a few years of notes reflecting on our performance of the past 4 or 5 NA’s and studied the some of events photos. We came to the understanding that if we focused on better up wind speed, and also perfected our second and third day tactics, we would realize the most gain in our overall results. Doing a little homework online, brought us to the Ullman website and an interview you did with Dave Ullman. The two of you were talking about his winning performance at the Melges 24 worlds. There was a great tip that he shared with the use of vang up wind. Ultimate 20 has that big roach in the main similar to the Melges 24 and keeping the main flat while you de-power is something we had not experimented with. Our bow person, Laura Bolin – a very experienced Thistle Sailor, focused her energy here and it helped us tremendously, as we were always one of the top boats at the first mark. The other area that we concentrated on was our tactics. We have one of the best tacticians around, with Brian Tyrrell and we’re always used to him feeding us information. We inverted that ‘information pyramid’ and started feeding him as much information as we possibly could, allowing him to concentrate more on the course and currents in the Berkley Circle. He did a fantastic job of breaking the regatta down into a leg by leg race. Mentally it was great to round the mark, and look ahead for boats to pass, as opposed to focusing on any misfortunes of the previous leg. 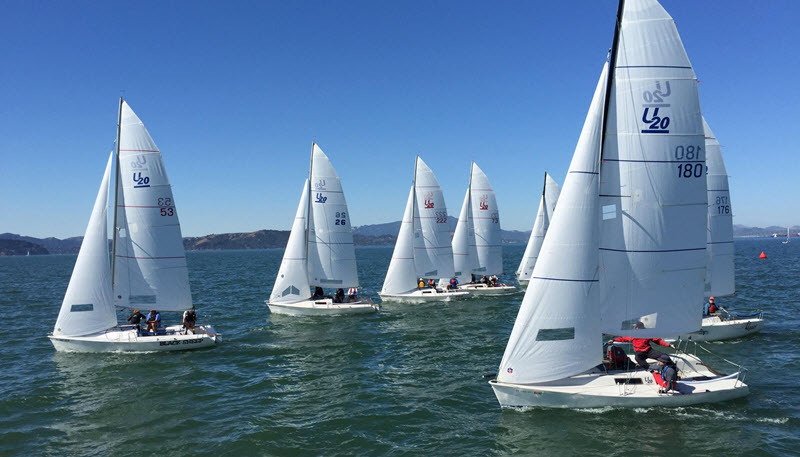 Fleet Week in San Francisco is a spectacular scene and the welcoming members of Richmond Yacht Club hosted a great event with on of the best race committees around. Thanks to Mike Josselyn as the event chair and super fun weekend! Team Black Sheep is Powered 100% by Ullman Sails. For more information on our Ultimate 20 sails click here.